Map of 3rd Thursday Art Crawl venues. Experience Camden's creative arts community in the historic and beautiful Cooper-Grant neighborhood and the University/Downtown district near the Camden Waterfront every 3rd Thursday of the month. This is a free and family-friendly event. Many one-hour, metered, and free street parking spaces are within walking distance of all the 3rd Thursday Art Crawl venues. Also, the City Hall PATCO stop and the Riverline stops are only blocks away from the participating venues. Ruby Match Factory Open House, ABC-6 Action News, late 2015. Camden gallery owners hope Art Crawl inspires change in the city, South Jersey Times, August 23, 2014. Camden's 3rd Thursday Art Crawls highlight city businesses, growth, South Jersey Times, August 15, 2014. 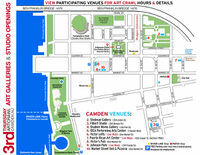 Raising awareness of Camden's cultural offerings, Philadelphia Inquirer, November 30, 2013. This page was last edited on 29 August 2016, at 14:09.